The DS Arms ESC - Enhanced Sand Cut complete bolt carrier group is the pinnacle of AR15 - M16 bolt carrier group production. We took our standard Mil-Spec bolt carrier group and ungraded with real world no-nonsense features that make sense, not just make it flashy! First and foremost we looked to our roots in the FAL Battle Rifle and incorporated L1A1 style sand cuts on the entire load bearing surfaces of the carrier. These sand cuts allow any sand, dirt or debris that may have gotten into the action to easily be cycled out. After the sand cuts we knew we would have to give this bolt carrier group a finish that puts function over form, the DS Arms NTFE - Nickel Teflon finish. We chose Nickel Teflon due to its fantastic properties. These include increased lubricity, exceptional hardness and extreme corrosion resistance. Our NTFE finish has a lower friction coefficient than Nickel Boron and because the Teflon is impregnated into the Nickel it maintains the lower friction coefficient longer than Nickel Boron. The DS Arms AR15 M16 Cut Complete NTFE Sand Cut Enhanced Bolt Carrier Group is perfect for your next build. We machine these assemblies using the latest manufacturing techniques, material and finishes. The carrier is shot peened 8620 Steel and the bolt is MPI 9310 material. The interior of the gas key & bolt location on the carrier is chrome lined per Mil-Specs. 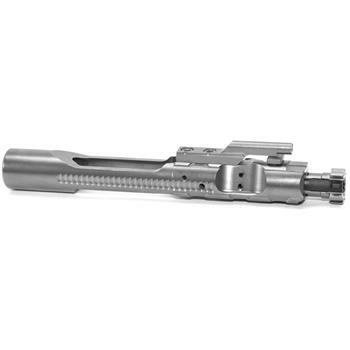 This complete AR15 M16 cut bolt carrier group assembly includes the complete bolt, complete carrier with properly staked gas key, cam pin, firing pin and firing pin retaining pin. Carrier features Enhanced Sand Cuts along the upper receiver contact points. Patterned off of the traditional FAL L1A1 Inch rifle, these sand cuts allow any sand, dirt or debris that may have gotten into the action to easily be cycled out.